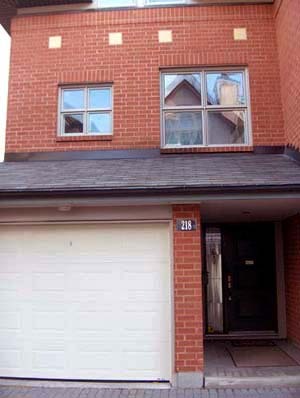 We bought our house in the Glebe in 1999, as we began to migrate from America back to Belgium. 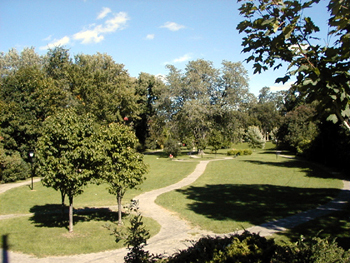 The location is in the Glebe in central Ottawa. We can walk to Parliament, the major market, downtown shopping, museums, banks, theatres, etc. Ottawa now sports a new international airport so we can leave town when it is too bloody cold in the winter - summer too I suppose. Our landscaping project was designed by Jacques Hamel. The construction was implemented by and Kevin Newman and Pierre Sirois. There were additional home renovations implemented by Pierre Sirois. We back onto a park. This is taken from the house rear deck looking East. The Rideau Canal extends out of the picture to the upper-right. (You can just make out stairs to climb up to the road and canal.) The canal is c75 kms long, but in the Ottawa City c20 kms are tailored and prepared for winter skating with snow removal, lights, music, and skates, food, etc. The park runs the same distance. We plan to donate and plant a large Red Maple in the park, behind the house. (In the picture to the front right as shown. 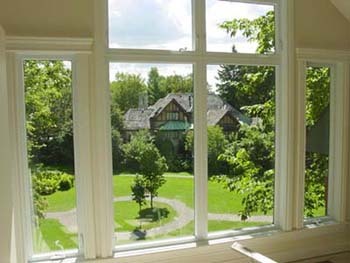 This is the direct south view from our new bedroom windows across the end of the park. The local shopping and restaurant area are to the right of this picture c200m. We replaced all the windows and both the interior and exterior doors. The outside doors are steel and the windows are low-energy, double-paned, with argon gas in the space between the panes. We varied the interior glass layer of transparent, silver oxide from one to two coats to allow some windows to support plant growth (which is stopped by the very low UV light passed by the doubled coat). Because of the high seasonal temperature variation in Ottawa the windows are made of wood, but sheathed in plastic to eliminate maintenance and wood rot from moisture on the glass. We insulated the garage inner walls after springing a leak and we'll paint the garage inside when we return from America. We also put on a new insulated garage door and lift motor. You can make out the over-hung main house entry. We widened the doorway by about a foot. The reflecting glass window is coloured. Oh yes we re-did the roof and those kitchen windows are new. OK, it's a silly picture. It is taken from the front bedroom widow to show Pam that we had clad the outside wood in coloured metal. That is important, because Ottawa has a fierce temperature-range of 80° Celsius and a lot of snow, ice, and rain. It plays hell with wood trim. We have used metal to cover the exposed wood around windows, etc, and plastic-sheathed windows. Much of the house is faced in brick. There are lots of trees in the area as you see. Our house is one of three in a row with a shared courtyard (on the right side of this photo) between us and the two neighbours facing onto the street. There is another group near us, but separated from us by a long garden next to our garage. We re-built the inside of the attic to ensure proper air-flow. The attic also has an additional layer of insulation, well beyond requirements and a temperature-controlled exhaust fan to vent hot air. 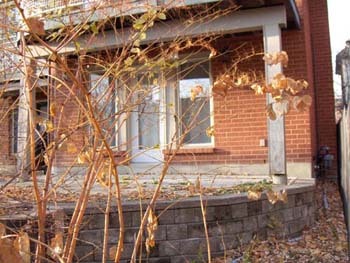 We plan to remove the rear fence and clear scrub growth. 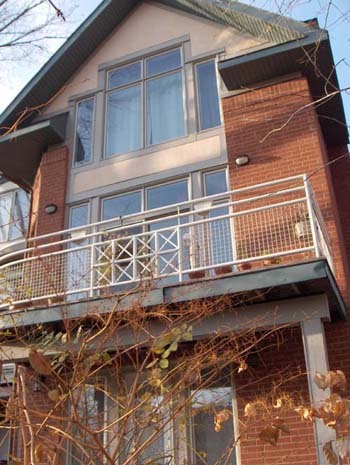 We'll remove the second-story wood deck - saving the upper metal railing, repaint the railing and rebuild plastic-wood material deck with a waterproof, insulated floor and lighting for a potential below-deck four-season enclosure. You can see this is an extensive list. We plan to remove and store the patio wall, discard the current pavers; dig out and remove the existing clay; attach a poured cement footing (to the depth of the house) for the deck supports; integrate eavestrough pipes, gas lines, electrical cables, and water into underground drains; replace the supporting fill with a new drainage material to a higher base level; expand the patio to the boundaries; coordinate house and patio levels plus neighbour patio level; integrate stone steps to park level and hide the air conditioner in a garage; plant some large flower trees in a patio garden and possibly a maple inside the park fence line; plant colour/smell shrubs in a patio garden; locate a gas BBQ on the east side; consider how to integrate a small water fountain; put up new rear fencing along park boundary; and integrate some low patio lights. 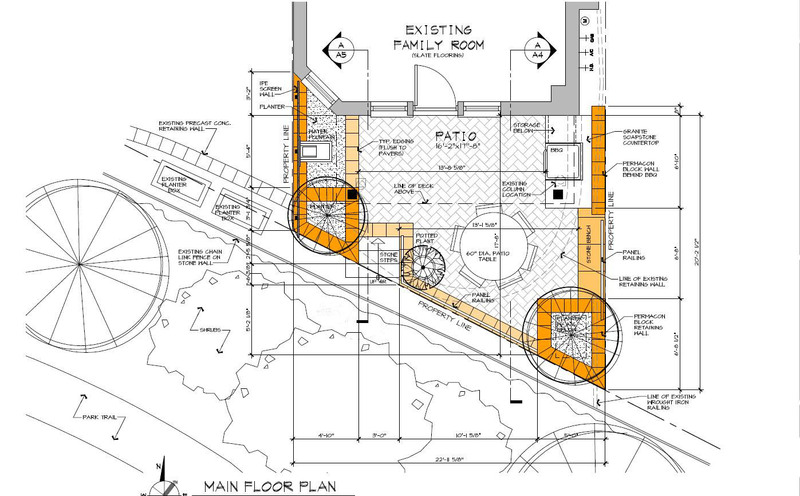 Jacques Hamel will design a new patio layout using Techo-Bloc materials. The layout format is as follows: I introduce the house by floors. First a plan, then room by room details, then the major furniture items, then primary wall colours.